It’s a lazy Sunday here at Cookbook Archaeology, so I’m sharing a fast, tasty brunch and introducing a new book. The new book is The Embassy Cookbook, from 1966 – a collection of menus provided by about fifty countries’ Washington, D.C. embassies. I’ve been on a produce binge, so I seized on New Zealand’s simple, lovely broiled tomato recipe and paired it with some scrambled eggs and toast. Broiled tomatoes are so simple, you say – why are you even bothering to make a post about this? Well, I’ve got news for you – broiled tomatoes are, indeed, very simple. But they’re nigh on revelatory when fresh, perfectly ripe, and, most importantly, sprinkled with chopped fresh tarragon. I only started cooking with tarragon pretty recently, but I really love this herb. It’s so delicate on first bite, but then has a surprising zing, like good banter in old movies. When paired with tomatoes, it pulls out their freshness and adds a little je ne sais quoi. Try tossing some in scrambled eggs, too. I often hesitate to buy fresh herbs because it can be a pain trying to use them up; this never happens with tarragon, though, because it makes the most lovely omelettes. 1. Cut the tomatoes in half crosswise. 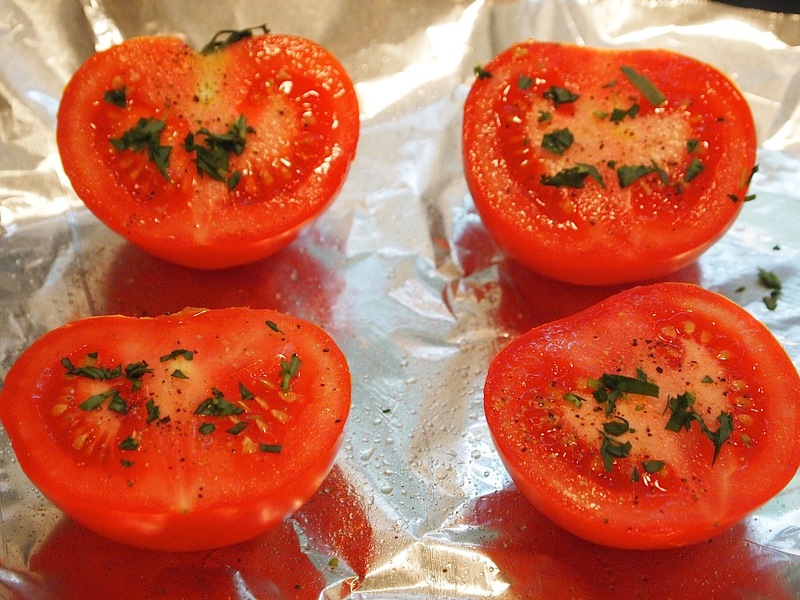 Spritz a baking pan with olive oil, place the tomatoes on it, and spritz them too. Sprinkle each tomato half with a little tarragon, a few twists of freshly ground pepper, and a dash of salt. 2. Broil for 10 minutes until tender and serve hot. I just planted some tarragon and have been kind of puzzled about what I can do with it, and this looks like a really good option. I love tomatoes as a brunch side. Looks great! Nothing lazy about your brunch..what a lovely plate full of amazingly delicious food!! yummy! Check out my blog, when you have a chance! Lovely post! Personally, I have an ongoing texture row with tomatoes but the hubby loves them so I’ll have to bookmark this for a day when he behaves. I tried clicking on the intriguing ‘good banter in old movies’ link but with no success! Such a tease! I love tomatoes with my eggs … I thought I was the only one. The tarragon makes this breakfast that much better! What a delicious accompaniment to eggs…a perfect brunch dish! Just a tarragon with oil/S+P? I’m making this soon! I need to buy delicious tomatoes for this!